These are the results from Eastbourne Magistrates’ Court, sitting at Hastings, for May 14 - May 17. Scott Leary , 33, of St Albans Road, Eastbourne, pleaded guilty to assaulting a woman by beating her. 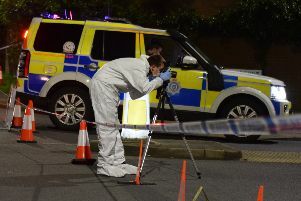 The offence took place at Leaf Hall Road, Eastbourne, on November 14. He was fined £500 and detained in the courthouse for a period. Harvey Arnold, 20, of The Hydneye, Eastbourne, pleaded guilty to stealing bottles of perfume of an unknown value from Boots at Eastbourne on December 24. He was fined £75. Shaun Brown, 53, of Percival Road, Eastbourne, pleaded guilty to driving an Audi vehicle on Eldon Road, Eastbourne, on December 11, without due care and attention. He was fined £30 and his driving record endorsed with six penalty points. Michael Stonestreet, 30, of Butts Field, Hailsham, indicated pleas of guilty to four charges of stealing scrap metal worth £750 from sites at Lower Dicker and Pevensey between November 15 last year and March 29. He also admitted being in breach of a conditional discharge made by an earlier court for an offence of theft. The court made a community order with a requirement of 200 hours of unpaid work and ordered Stonestreet to pay £750 in compensation. Jamie O’Neill, 19, of Elgar Way, Eastbourne, pleaded guilty to assault by beating. The offence took place at Eastbourne on December 15. The court made a community order with a requirement for him to complete 40 hours of unpaid work. Kyle St Aubyn, 38, of Hawley Road, Camden, London, pleaded guilty to being in charge of a Peugeot panel van vehicle while over the drink drive limit. The offence took place on the A27 at Berwick, on January 3. He gave a breath alcohol reading of 61 micrograms. The legal limit is 35 micrograms. He also indicated pleas of guilty to being in possession of a selection of kitchen knives in a public place and to being in possession of a quantity of cannabis. He was sentenced to six months in prison, suspended for two years. The court made a community order with a requirement of unpaid work. He was fined £100 for the motoring offence and banned from driving for four months. Rhiannon Ostler, 25, of Balmoral Mews, Polegate, pleaded guilty to driving a Fiat vehicle on Compton Road, Eastbourne, on April 29, while over the drink drive limit. She gave a breath alcohol reading of 70 micrograms. The legal limit is 35 micrograms. She also pleaded guilty to driving with no licence or insurance on the same date. She was fined £100 and banned from driving for 17 months. Walter Tame, 29, of Walton Close, Eastbourne, pleaded guilty to being in charge of a Citroen vehicle on Service Road, Eastbourne, on October 7 last year with the controlled drug benzoylecgonine – a metabolite of cocaine – in his bloodstream. He was sentenced to two weeks in prison. Magistrates said the reason for the sentence was due to his previous convictions. His driving record was endorsed with ten penalty points.